Competition will be offered in 7 age divisions: U-9/EDP Coed, U-10 boys, U-10 girls, U-11 boys, U-11 girls, U-12 boys, U-12 girls, U-13 boys, U-13 girls, U-14 boys, U-14 girls, as well as a U15 division to accommodate 2004 birth year players. Please note: age groups and divisions are dependent on the number of applications received in that age group and division. The Tournament Director retains the right to combine age groups if needed. U-9 and U-10 divisions: Match format is 7v7. The tournament will be a round-robin non-results format, with a guarantee of 3 matches per team. U-11 and U-12 divisions: Match format is 9v9. For divisions with 4, 6, or 8 teams, tournament will consist of 3 preliminary matches and a playoff/final. For divisions of 5 teams, teams will play 2 games each on Saturday, with the top seed advancing to the final on Sunday. #2v#3 will play in a semifinal, with #4v#5 in a consolation match. All teams are guaranteed at least 3 matches. A tournament champion will be recognized for each division. U-13 through U-15 divisions: Match format is 11v11. For divisions with 4, 6, or 8 teams, tournament will consist of 3 preliminary matches and a playoff /final. For divisions of 5 or 7 teams, teams will play 2 games each on Saturday, with the top seed advancing to the final on Sunday. #2v#3 will play in a semifinal, with #4v#5 #6v#7 in a consolation match. All teams are guaranteed at least 3 matches. A tournament champion will be recognized. Matches will take place on Saturday, October 6, 8:00am-6pm, and Sunday, October 7, 8:00am-6pm. Teams will receive their awards after the final match in their age group. All teams need to check-in prior to the first scheduled game for the event. All teams must check-in at the registration tent at the facility where you first match takes place at least 1 hour prior to their first match, and the check-in area will open at 7:00am on Saturday. Tournament headquarters is located at the Seacoast Express United Field Complex at New Hampshire Technical Institute (NHTI), 20 College Drive, Concord, NH. Basic refreshments (cold drinks, coffee, and snacks) and food will be available for sale at the tournament site. Directions: I-93, Exit 15 East to I-393 to Exit 1 and follow signs for New Hampshire Technical Institute. Matches for all U9 & U10 divisions will take place on the campus of NHTI. The regular entry fee is $450/team for U8-U10 teams, $550/team for U11 and U12 teams, and $600/team for U13-U15 teams. All applications must be received by Monday, September 17, 2018. All out of state teams must submit a permission to travel form approved by their state. The tournament is open to any U9, U-10, U-11, U-12, U-13, U-14 and U-15 travel or rec team registered with their state chapter of the US Youth Soccer Association or US Club Soccer. All players must be registered with the US Youth Soccer Association or US Club Soccer and either be listed on a state approved roster or have player passes. 3. Medical Release Forms for each player. Medical release forms can be downloaded here. Competition will be offered in 14 divisions: U-9 boys, U-9 girls, U-10 boys, U-10 girls, U-11 boys, U-11 girls, U-12 boys, U-12 girls, U-13 boys, U-13 girls, U-14 boys, U-14 girls, and U14/15 divisions. Please note: Age groups and divisions are dependent on the number of applications received in that age group and division. The Tournament Director retains the right to combine age groups if needed. Requirements for Check-In: Teams must present their USYSA Roster/US Club approved roster, player cards, proof of permission to travel (if required by your state), and guest player approval forms, and completed tournament medical release waivers. Eligible Players: Only those players appearing on the teams travel roster will be eligible to play. Each team must be prepared to provide a copy of the birth certificate of each player. 3. Current signed state Medical Release form for every player, including guest players. Our tournament medical release form can be downloaded here. 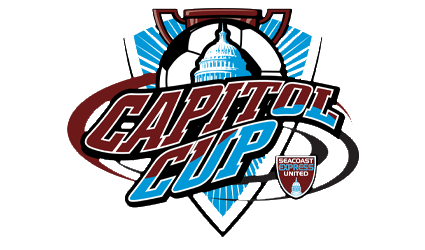 Any club travelling to the Seacoast Express United Capitol Cup Columbus Day Tournament with more than one team may choose to move a player up for any game throughout the event. However, no player is allowed to play in more than five games at the event when moving between teams. The player & coach must have permission from their club director and subsequently from the tournament director before writing the player onto the game roster and presenting his or her pass of the same club during tournament check-in. Home Team Responsibilities: Home team (first team listed on the schedule) will be required to change jerseys in the event of a color conflict. The home team will have the choice of side of field, and will supply the game ball. The game ball will be subject to referee approval. U9 and U10: Friendly format (non-competitive), guaranteed 3 games. Defending teams must drop back to half field on all goal kicks, allowing opponent to advance the ball into play successfully. Once the ball has been put in play, the defending team can advance past midfield. No playoffs for U9 or U10 teams, although the 3rd game may be "based on standings" for best competitive matchup. **In the event of a forfeited game, the winner will be credited with a 1-0 win and awarded 3 points. A team will be allowed to play with a minimum of 7 players for an 11v11 match, 6 players for an 9v9 match, and 5 players for a 7v7 match. If the team is not able to field a team after 10 minutes of the start time of the match, it will be considered a forfeit. The game score will be recorded as 3-0 (10 points) in favor of the team that was present at the game time. There will be no refunds for teams withdrawing after the acceptance date of September 21, 2017. In the case of entire tournament cancellation due to inclement weather teams will receive a refund after incidental costs occurred to that point have been deducted from entry fee. 5 team division: Teams play 3 games with seedings determined after completion of 2 games. 3rd game format is as follows: #4v#5, #2v#3 (semifinal), while #1 seed receives a bye to the final. Winner of semifinal game plays #1 seed in the final. 6 team division: Two brackets of three. Teams play the two teams in their bracket, then 3rd game is based on seedings. Winners of "semifinal" games advance to final, while the #3 seeds from each bracket meet in a consolation match. 7 team division: Teams play 3 games with seedings determined after completion of 2 games. 3rd game format is as follows: #6v#7, #4v#5, #2v#3 (semifinal), while the #1 seed receives a bye to the final. Winner of semifinal game plays #1 seed in the final. All matches must use federation certified referees. Joe Linquata shall be the referee assignor for the tournament. Tournament scores shall be posted at the tournament site and on the tournament website. Referee shall submit signed game cards containing the game score to field marshals to report to the tournament booth after the conclusion of each game.